This section describes how to run bitcoin-qt command to start Bitcoin Core. 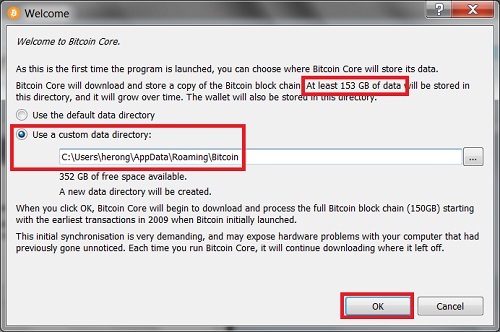 Bitcoin Core will store its data. transactions in 2009 when Bitcoin initially launched. downloading where it left off. The message is clear. Bitcoin Core will down all transactions recorded in the entire Bitcoin blockchain to my computer. This is not what I expected. I thought Bitcoin Core only manages my Bitcoin account and fetches transactions if I ask for. Anyway, I clicked "OK" to let it run. You should see the "Bitcoin Core - Wallet" window displaying the progress of download old transaction blocks.